Subscription-based products allow you to add predictability to your revenue. You can sell physical or virtual products and even services to your buyers at a recurring fee. You don’t have to constantly chase more & more traffic and you can start making the most from every customer you acquire. The WooCommerce Subscriptions plugin lets you create and manage subscription-based products. In this post, I’ll share with you the best strategy to sell subscription-based products i.e. using one-click upsells. Keep reading to learn all about it. 4. Where’s the real estate to convince them about the benefits? As per the Marketing Landscape 2019, a report published by Adweek, it is 5 times more expensive to acquire a new customer than sell to the same one. This means, most business owners spend a lot of money on acquiring a new customer through ads, deep discount on the first order, free shipping, re-targeting & more. And they don’t even make that money back with a one-time purchase of the customer. If you have subscribers paying you each month or even annually, you can count on them. And the best part is that you don’t have to make extra efforts for this money. You only have to ship the goods on time every time. This predictability means that you can plan your marketing activities and upcoming expenses more accurately. Let’s say a customer has subscribed to you for a pack of supplements. They need these each month. It’s very obvious that as long as they’re subscribed and happy with your on-time delivery, they will not even think of going to your competition. But a one-time buyer has no reason to be loyal to you. He’s open to exploring other choices for his next purchase. There’re no strings attached here. Subscription is a great source of consistent and predictable revenue. You may think it is hard to turn prospects into subscribers but it’s not. You can actually mine for profitable subscription ideas by doing a bit of research. Take a look at Cratejoy – it’s a marketplace for subscription-based products. You’ll be surprised to see what all is possible. From flowers to razors to beauty products and more! For example, if you’re a parent, you’d love to subscribe to this box of educational toys and games. Each month, you’ll have something amazing coming home and you won’t have to crack your brains over the next engaging game. Dollar Shave Club grew to challenge the monopoly of Gillette by creating a subscription-based grooming brand. They offered low-dollar trials and no-hassle cancellation policy to strengthen their case for subscriptions. Nobody starts off by thinking about sustainability and profitability. Look at the number of blog post teaching how to increase sales but there’s not so much discussion over retention. Thanks to soaring acquisition costs, retention now makes for a smart investment. While you may believe that it’s hard to convince people to sign up for subscriptions, think from the buyers’ perspective. They’re time-strapped and forgetful. It’s hard for them to remember to reorder on time. It’s harder to find the time on a busy day to go through the entire purchase process. And if that product is a necessity, it’s actually hard to stay without it till the new one is ordered. This is a biggie! Your entire WooCommerce store is focussed on one-time purchases. The job of the home page is to direct them to the product catalog. And the call to action on the product pages is ‘add to cart’. You don’t have the real estate to convince them about the benefits of subscribing. The goal of your website is not supposed to be to sell subscriptions. The goal is to get them to make a small commitment by making a one-time purchase. And once they’ve done that, sell a subscription. Subscriptions make for great one-click upsells because by that time your initial purchase is secured. From a buyer’s perspective, buying a subscription obviously requires more thinking time and more trust than a one-time purchase does. So it’s a sensible decision to lock the initial sale before making a pitch for a subscription-based offer. Also, by then you’ve already secured the initial purchase so you’re in a risk-free zone now. Let’s look at how to upsell subscription-based products post-checkout using Upstroke one-click upsells. The WooCommerce subscriptions plugin is the official WooCommerce plugin developed by Prospress that allows you to create and manage products with recurring payments. You can refer to its documentation here to learn how to set it up. The Subscriptions add-on of UpStroke one-click upsells allows you to upsell subscriptions on one-time purchases and one-time purchases on subscription-based products. You can also upsell subscription-based products to guest checkout users. This is a very useful feature and UpStroke is the first one in the WooCommerce space to offer it. When you install the WooCommerce subscriptions plugin, you’ll be able to configure all the settings for the subscription-based product. You can set up the trial duration, signup fee, renewals, cost of subscription etc. Configure a rule here to define their main purchases such that if they’ve bought ‘product X’ upsell ‘subscription Y’. You can also use the ‘And’ & ‘Or’ conditions to use multiple rules in conjunction with each other. Use the Rule Builder to select the main product. Select the subscription-based product here that you’d like to upsell with a single click. You’ll see an additional setting here i.e. ‘discount on first renewal’. 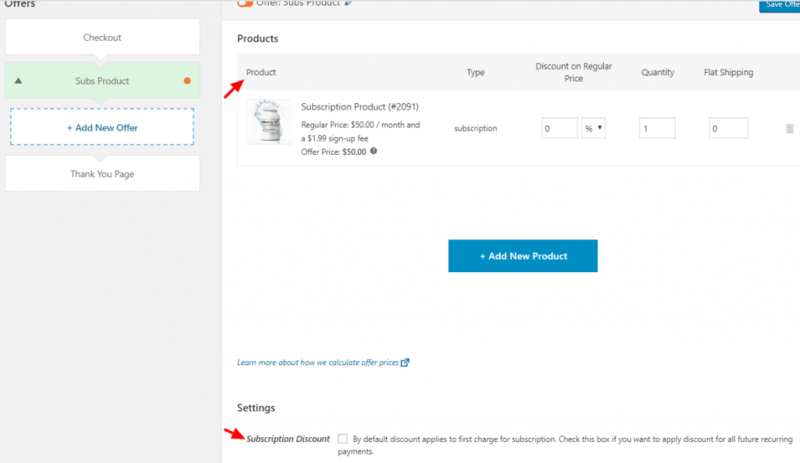 You can either offer a discount on the first subscription or on all subsequent subscriptions. Check the ‘subscription discount’ box if you want to apply a discount for all future recurring payments. You can use the in-built customizer or any of your favorite page builders to create an upsell offer page. Notice the call to action button is in the first person and also very clear. 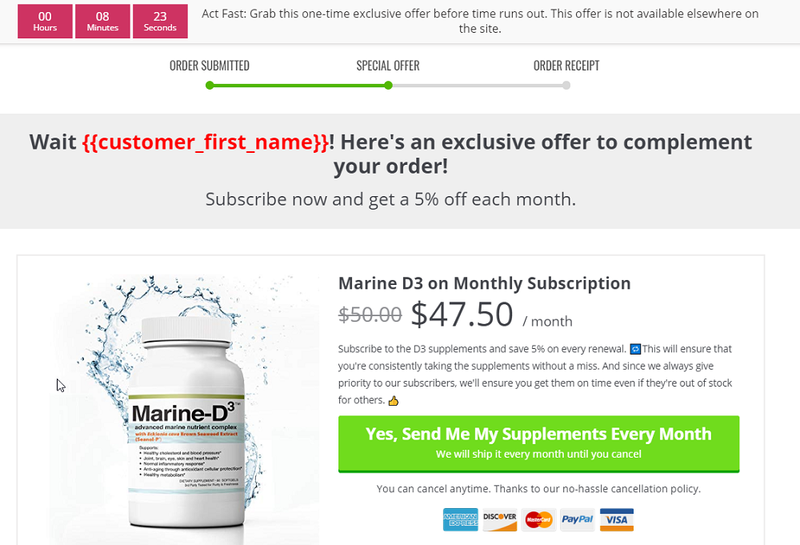 The description conveys the benefit by highlighting how subscribing will not only help them save bucks but also ensure they take the supplements without giving it a miss! We’re also pulling the urgency trigger here that we cannot on the conventional product page. You’re now ready to upsell subscriptions after checkout! If you’re selling products that need to be replenished after a certain interval of time, upselling subscriptions will be a great profit-booster for you. You can even draw inspiration from CrateJoy to create subscriptions that stick. If you’re selling training and education – think of creating a members’ area with educational content that people can subscribe to. And they should be able to access the content for as long as they stay subscribed. UpStroke one-click upsells is compatible with both WooCommerce subscriptions and WooCommerce memberships developed by SkyVerge. So, what do you plan to upsell as subscriptions? Let me know in comments.